Instead of typing out a free-form hotel experience review on your laptop once you get home from your trip, or struggling with your smartphone’s virtual keyboard for several long paragraphs, Hotel Tonight has a better idea: just use photos. A new feature, that the mobile hotel booking app is introducing on Wednesday, is called Snap Your Stay. 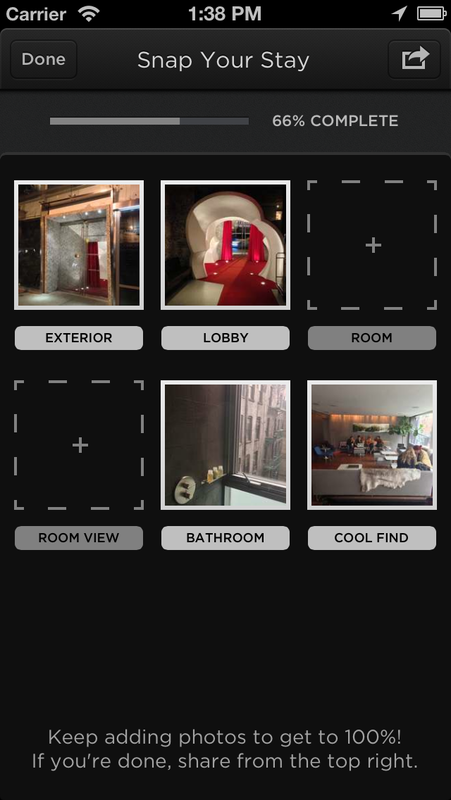 By relying on the smartphone’s built-in camera, the app for last-minute, day-of bookings is looking to enhance its carefully curated hotel choices with photo-based user reviews. Hotel Tonight started asking for users for simple thumbs up or down reviews nine months ago and began sharing those responses as “percentages of users who’d recommend this hotel” in September. But the Snap Your Stay feature will add more information that a simple user recommendation. The new feature is sort of a guided scavenger hunt: users get a template with places to fill in six photos, with a request for specific highlights of the room you’re staying in an a “wild card” photo for something you liked about the hotel. The idea is for it to be simple and fast, with just a few taps on your phone. Other travel and booking sites want user reviews, but the major ones, TripAdvisor’s, for example, require text input even in their mobile apps. And Yelp(s YELP) doesn’t even allow mobile reviews — you have to sit down at a computer to compose them. Hence, Hotel Tonight’s attempt to stand out with photo-oriented reviews. This method allows users filling out reviews to avoid typing descriptions on their phone — and users reading them don’t have to wade through pages of text on their phone when they’re trying to make a last-minute hotel decision. In addition to that, Shank says it’s a good way of only allowing reviews from people who’ve actually stayed at the hotel and booked through the app. Because smartphone cameras are so good, Shank is confident that images submitted will be pretty high quality. But please, no Instagram photos: “We want Hotel Tonight photos to look different, don’t want them to look vintage, or black and white, or like they’re from 1977. So we have a dimmer switch to brighten them up.” Which, Shank points out, is going to be good for indoor room photos. Hotel Tonight, just over two years old, is now in 12 countries, nearly 100 cities and has been downloaded to 5 million iOS(s aapl) and Android(s goog) devices. In addition to the photo-based room reviews, the app also plans to introduce on Wednesday guaranteed room rates: if you find a lower rate on another site, tell Hotel Tonight and you’ll get the dollar difference back in Hotel Tonight user credits. You can get a $25 credit by using the promo code BGrant25! I love this APP!!! Use LHALE4 to receive $25 off your first booking! I have used it many of times and never have paid over $50 for a beach hotel!!! I highly recommend this app!! Awesome App!! 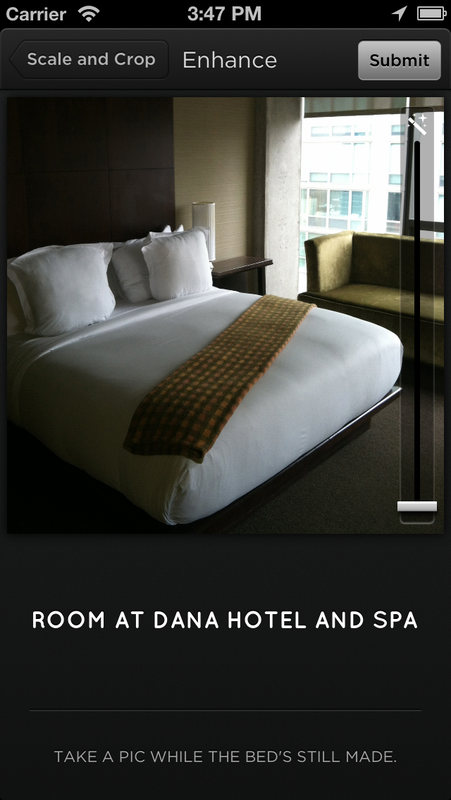 I love that you can see the EXACT hotel you’re booking… and all of it’s amenities with pictures! (Even the pet policies are listed, which is a huge plus for a dog parent!) I’ve used it a couple times and have had great rooms every time. Hello, $25 to stay in Vegas last minute? I also stayed at the Red Lion on the River in Portland for only $66! PLUS, They even give you $25 off your first booking… Use the promo code: CCOOLIDGE3 to get $25 off!